Grocery shopping is a big chore that not a lot of people enjoy, so how can you make it easier? Some grocery stores try and make up for the experience by offering samples as you scrummage your way through the aisles. But yeah, shopping for stuff you need to sustain you for another week isn’t exactly fun. It’s time consuming, requires considerable effort, planning and has the potential to become a complicated mess. Having diabetes definitely doesn’t help in this endeavor. This is where Registered Dietitian Kaitlin steps in to save you from your grocery shopping miseries and confusions by leading a grocery store tour. She’s pretty, funny, and extremely knowledgeable about healthy eating with diabetes…aka the perfect person to lead you on a tour through the maze that is the grocery store. 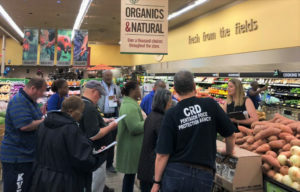 The group strolled from point to point in Safeway making stops to talk about what foods to avoid and what should be eaten if you have diabetes. The start of the tour was in the produce section. We then shuffled our way to the dairy aisle where Kaitlin talked about some pros and cons of real and fake butter. Carrying onto the aisle of what most people see as their worst enemy... the candy aisle, our registered dietitian pointed out ways to still be able to enjoy a sweet treat now and then. The next stop was the overwhelming rows of cereal. Kaitlin talked about what makes a cereal a good choice, especially for diabetes, and which ones she recommended. We continued through the snack, bread, deli meat, and frozen food aisles, all the while being briefed on vital nutritional info and personal recommendations from our helpful guide. Throughout the tour, I could see and hear the interested participants starting to pick up different items and look at the nutrition label along with Kaitlin as she was discussing whether or not the item would be a good choice. They knew where to look for the information they needed. It was a great walkthrough of learning to shop healthy and smart. The final stop was at the back of the store in the pharmacy. 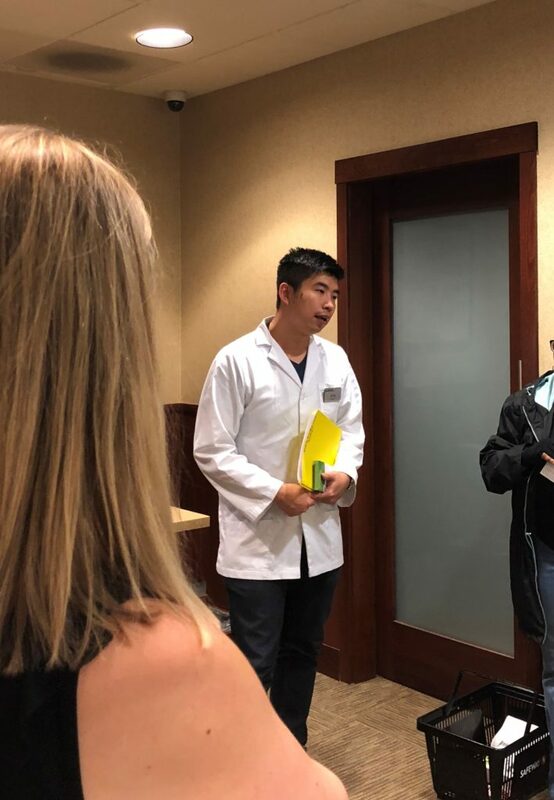 Here, the store pharmacist explained the different ways available to monitor blood glucose levels and how important it is to measure that along with your A1C. By the end of the tour, multiple questions had been answered and everyone was more knowledgeable for their next journey through the aisles. If you’d like to learn more and gain confidence in grocery shopping for healthy food please join us for our next grocery store tour! We’ll be offering tours throughout the summer. Email Kaitlin at kaitlinwilliams@rbitzer.com or call our office at (301) 474-2499 to express your interest and sign up for future tours.